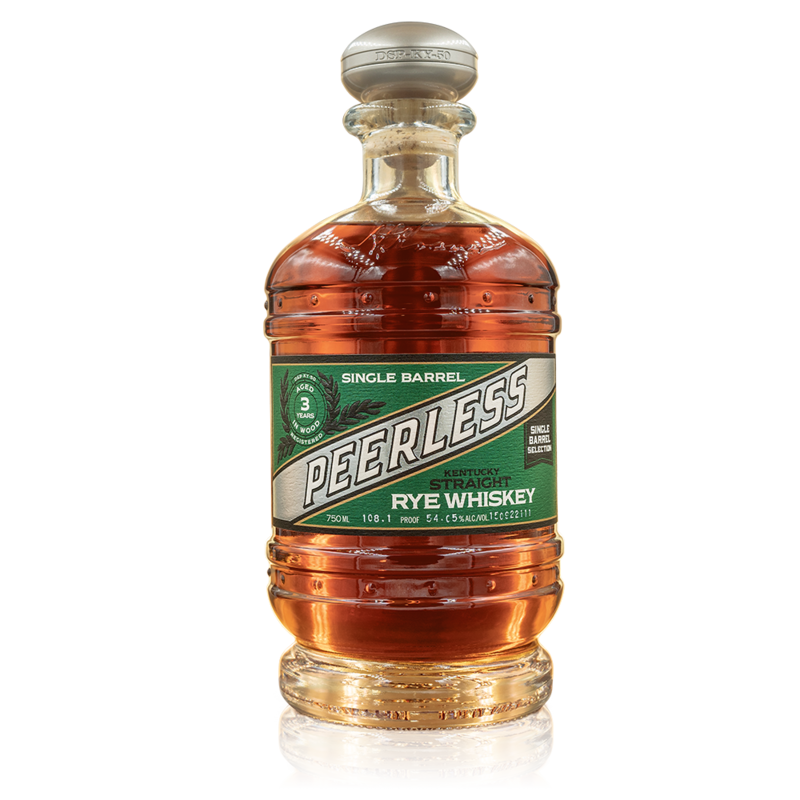 Peerless Dimensions - Peerless Distilling Co.
Kentucky Peerless’s identity as an artisan distillery is centered on its uncompromising quality and innovative nature. There is no better exemplification of this than our Single Barrel program. Head distiller and team promote only barrels of supreme quality and uniqueness for consideration to be a single barrel. Rare notes and characteristics that make each barrel stand apart from our standard profile are celebrated and show off the range of our products. Typically, selections are chosen by liquor stores, bars and restaurants that can accommodate the full volume of a single barrel. In the interest of making Peerless single barrel selections accessible to everyone who wants to embrace the Peerless experience, Head Distiller Caleb Kilburn will be releasing 15 barrels of his own selection for distribution. These selections will allow anyone to showcase a distiller-selected single barrel with a minimal investment. To highlight the layers of flavor, complexity and depth of character behind our story and our products, we introduce Peerless Dimensions. Deep grassy and floral herbs define the early nose. Leather, sweet oak and faint cherry bitters also join. The taste starts with an oak-infused sweet tea before rolling on to feature maple syrup, chocolate and a touch of cinnamon at the end. The second sip is spicier all around, showcasing spicy oak in addition to all of the aforementioned notes. The finish carries on the dark chocolate character and compliments it late with oak tones. The finish is spicy and bold. Fruit reduction and cocktail bitters, both cherry and orange, light up the nose. Earthy characters such as leather and tobacco also join. The taste starts with brief sweetness before being overtaken by cinnamon and then milk chocolate. Joining the chocolate late is a cocktail cherry taste. The second sip reveals a sweet oak as a compliment to the cinnamon and the chocolate is now dark. The finish takes the late dark chocolate-covered cherry character and draws it out long, complimenting it with bursts of sweet oak, tobacco and floral notes. This barrel highlights how sweet and fruity notes can mesh so well. The nose starts with a dark fruit syrup and cream. Earthy characters of leather and tobacco heavily compliment this barrel. A creamy chocolate also becomes really prominent. The first sip starts sweet like chocolate, but shifts to feature sweet oaks, dark fruit and a hint of sweetened cream cheese. The second sip has more oak and spice, but the progression remains the same. The chocolate character lasts through the entire process and creates a unique experience. The barrel carries on with a combination of oak and cocoa for a long finish with bursts of refreshing fruit. The nose starts with a deep cooked dark fruit note. Sweetness and earthiness join, creating an Old-Fashioned aroma. The smell continues to evolve, showcasing tobacco and sweet oak. The first sip starts with a hint of sweetness before rolling into a burst of sweet and spicy oak, cinnamon and cocoa. The second sip features a dried oak rather than the sweet one and shows off the prominent mouthfeel. The finish carries the dry, dark chocolate character on and gives the mouth the same sensation that it would have if it had just finished a dark chocolate rye truffle. The late finish remains bold and highlights a lingering earth tone. Butter and maple syrup create this nose. Vanillas and sweet oaks also join. As it opens up, a floral freshness also begins to evolve. The taste starts with a cinnamon-spiced chocolate character, but then opens to reveal deep florals and spicy herbs. The second sip is creamier and spicier than the first, opening up to dry spicy oak. The finish carries on with the spiced dark chocolate character and shifts to feature an increasing amount of oak, both sweet and spicy. Later, a few hints of floral notes come in to compliment the exceptionally dry and dark oak. A floral and herbaceous note comes to life from the first nose. Citrus, tobacco and hay further develop the complexity of the aroma. It further opens up to develop a nice caramel note to round out the flavor wheel. The first sip starts creamy and sweet before a wave of sweet oak and cinnamon takes over. The second sip is a heightened form of the first, but now features a return of the floral spices that lit up the nose. As it carries into the finish, the florals become more prominent and the sweet oak is also revived. There is a bold and complex character in this finale to such a unique barrel. The nose starts with a creamed chocolate and toffee note. It is backed by a clean floral quality and is followed by spiced oak. The taste starts with a dark chocolate honeycomb candy taste that is nearly immediately joined by a sweet and spicy oak medley. Then it transitions to show off cinnamon, earthy rye and dark cocoa. The finish is marked by a burst of florals. As one encounters this extended finish, the honeycomb candy returns. This barrel shows off the blurred lines between the sweet and the earth wedges of the flavor wheel. Cinnamon-spiced black cherries bring a mixology component to the nose of this barrel. It continues to open up to feature incredibly fresh, floral characteristics. There is a struggle for dominance in the palate between sweet candied oaks and an intense earthy character of leather and oak spices. The second sip favors the spicy earth notes and later reveals a rich herbaceous nature. The herbaceous notes build into a full-blown finale, complete with sweet oaks and hints of chocolate. This barrel features the complexity that makes Peerless so special. The nose starts with an earth and preserved fruit note. The warm, sweet nature evolves to feature floral notes and faint butterscotch. The first sip starts with an extremely warm, spicy, earthy wave that is well-accompanied by a really sweet oak syrup. The second sip better defines the spice as cinnamon and adds in a distinct cocoa note. The finish begins when fruit and sweet and smoky tones show up in waves, intermittently establishing dominance over the entire palate. Florals and caramel-chocolate candies jump out of the glass on the first nosing. A sweet oak and subtle coffee note join, giving it a mocha edge to it. Earthy notes also come through like hay and leather. The first sip starts with a hint of spice before rolling into a bold sweet oak taste. A spicy herbaceous note is in the background for this entire process. The second sip is much drier and even more woody, but it is still backed by the herbaceous nature. The finish features a bold and spicy finale with a sweet oak taste that lasts long beyond the sip. The nose starts herbaceous and sweet. Other fresh greenery, oak and leather all join the aroma. Cinnamon and rye spice arrive late but establish themselves as dominant notes quickly. The taste starts with generically sweet earth tones before developing a sweet oak and leather palate. Late, dry oak and bitter cocoa carry on. The second sip is much spicier and enhances the leather and rye spice from the first sip. The finish carries on for a long earthy finish. This barrel raises the bar and is sure to be well-received by any traditional rye drinker. Caramel and tobacco lead off an extremely bold nose. Sweet oak and fresh cut oak lumber create an earthy balance. Leather and smoked toffee also join late. The first sip starts ultra-creamy, with a burst of sweet cinnamon. A toasted, buttery, dark chocolate croissant comes to mind later in the tasting. The second sip features a few hints of fruit and floral on the front end, but largely remains the same. The finish features a return of those fruity components as they overpower nearly everything from the tasting, creating a complex and refreshing finale. Late, echoes of toasted marshmallow and sweet oak create the finish. The nose is bold where cinnamon and oak are joined by a less traditional note, dry tea. It continues to open up, revealing a subtle caramel and dark fruit bitters. The taste starts with a brilliant burst of fruits including cherries, oranges and cooked raspberries. It then escalates to feature brown sugar and then cinnamon on the prior fruit notes. It becomes oak-centered at the end. The second sip follows the same progression, but with a greater emphasis on the cinnamon to oak transition. The oak character rolls on into the extended finish, which highlights the significant mouthfeel of this barrel. The nose starts with soft, warm caramel and chocolate with a generic fruit infusion. As it opens up, the fruit defines itself as white fruit, primarily pear, but the nose is still dominated by the sweets. The taste starts with a clean sweetness, but then shifts darker to brown sugar and molasses. Sweet oaks further this transition and a nice dark chocolate arrives late. The second sip adds a spiced cinnamon component to the experience. The sweet oak, dark chocolate and cinnamon all carry long into the finish and are all enhanced by the mouthfeel. Later, a floral sweetness joins the batch, cleaning the palate and inviting one to take another sip. The nose is salty, crispy, leathery and earthy. It further opens up to showcase deep florals that are nearly perfume. The taste starts with a burst of fruitiness followed by a savory and fatty red wine braising liquid. This ultra-unique barrel then shifts to reveal dark chocolates, tobacco and fruit bitters. Complex oak notes join ranging from sweet and light to dark and spicy. This carries on to an extended finish with a combination of leather, sweet oak and a fruit freshness.